The Employee Free Choice Act would make it easier for workers to organize new unions. This would probably increase unionization in the United States, and unsurprisingly, corporate America is fighting EFCA like a pack of crazed weasels. But today Lane Kenworthy points out something that’s also been in the back of my mind during this whole debate: just how big a deal is EFCA, anyway? Why the full court press against it? Right now, private sector union density in the United States is around 8%, and if I had to guess I’d say that EFCA might — might! — increase that to 10% or so. Maybe even 11%. Is that really worth going nuclear over? Kenworthy’s own skepticism is mainly based on the chart on the right. 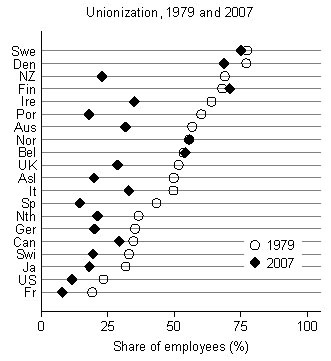 Sure, America has uniquely unfriendly labor laws these days, but outside of Scandinavia, where union membership is required to remain eligible for unemployment benefits, unionization has been dropping like a stone practically everywhere. So just how much impact do different regulatory regimes have, anyway? I would like to see EFCA become law. The ability of workers to bargain with management collectively rather than individually is, in my view, an important element of a just society, and these days the playing field is too heavily tilted in management’s favor. But I doubt EFCA will get us very far in reducing income inequality. Extension of union-management wage settlements would likely have a bigger impact, but at the moment that isn’t even part of the discussion. And not likely to be, either. We have a long way to go.